:New Southern Gospel album from the Brown family. 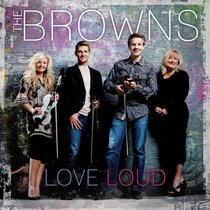 Love Loud is the first Browns release on a major label. It features 4 songs written by the Browns with award-winning co-writers, including producer Wayne Haun. The instrumental skills of the three children combined with their high energy vocals and harmonies make this a memorable and colourful breakthrough CD. It's truly a family affair when The Browns hit the stage with their gospel music. The musical stylings of Shelly, Michaela, Adam, and Andrew exude excitement on the stage and offer a life-changing experience to all who hear them. The Browns deliver the powerful message of the gospel through word and song that engage audiences of all ages. The Browns have been touring across the United States since the group began its full-time ministry more than a decade ago. The heralded group began on the local and state level and has expanded and grown into a national touring group. From singing over 30 shows at the Americana Theatre in Branson, MO, to Dollywood Theme park stages, to singing on over 10 Royal Carribean and Carnival cruise ships this award winning family will inspire you with their close-knit family harmony and talent. The Browns love what they do, love each other, and the audiences to whom they sing!